There is nothing more pleasant to the eye than to see a beautifully vibrant green lawn that is truly satisfying to a gardener and householder. Unfortunately this site is not as common as one would like. This is not because it is beyond sight or hope; actually a beautiful garden lawn is in any ones reach to attain, it is just knowing where and how to start. The easy way is to start with us. The problem with lawns for people is that things like weeds silently creep in and take over the lawn and suddenly it can seem that the grass has been irreversibly claimed by weeds before you had time to realise it. This doesn’t have to be the end. With the correct assessment and care, many and most lawn problems can be rectified and healthily maintained. To be fair apart from exceptional garden experts out there, many people find lawn care not only mind boggling but time consuming. A lack of correct chemicals and tools can only add to the frustration and cost of getting the job done, that’s why one of our most common services is giving customers correct and great lawn care. 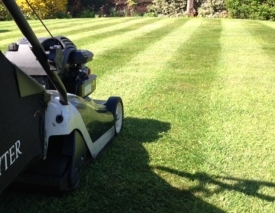 This includes carrying out regular weed killing and scarifying when needed. Not forgetting the importance of feeding your lawn with the correct fertilizer.